This really has to be the greatest photo ever taken in music history. 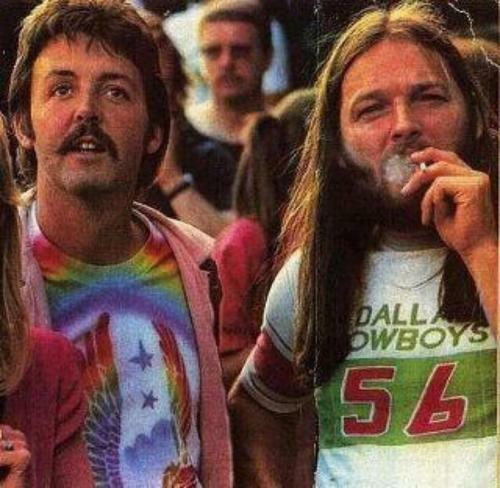 David Gilmour smoking a joint (in my mind at least, because cigarettes are gross) with Paul McCartney, allegedly at a Led Zeppelin concert. If only someone had a Tardis or a DeLorean to take me back to this moment. This entry was posted on Monday, April 30th, 2012 at 1:40 am	and is filed under Awesome Things. You can follow any responses to this entry through the RSS 2.0 feed. You can skip to the end and leave a response. Pinging is currently not allowed.